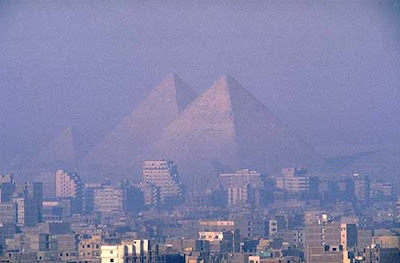 The land of Egypt is the child of the Nile. More than 4,000 miles above its mouth the White Nile rises in the swamps and lakes of equatorial Africa. After having covered half its course, it is joined by the Blue Nile in the Sudan and after another 200 miles the big stream receives its last tributary, the Atbara. In large bends the Nile then forces its way over five cataracts, the most northerly of which is at Aswan, the ancient Syene. From here onwards Egypt begins and the Nile valley becomes a narrow emerald band of vegetation through the surrounding desert until, more than 800 miles downstream, the waters fan out into the Delta. Ten or twenty thousand years ago the increasing aridity oj the Sahara forced the nomadic hunters into the Nile valley and the Delta where they developed agriculture and husbandry. The crops were wheat and barley and they tamed the sheep and a longhorned breed of cattle. The early inhabitants were segregated into tribes, each with its local god, often represented by a totem animal, such as the lion, the crocodile, the baboon, the ibis and many others. Later on, all these gods became the emblems of Egypt’s provinces, or nomes, as they were called. In historic times there were forty-two nomes, twenty in the valley and twenty-two in the Delta. As time went on, some of the tribes formed groups and about six thousand years ago they had coalesced into two kingdoms, that of the valley, Upper Egypt, and that of the Delta, Lower Egypt. The physical and economic differences between the two kingdoms were responsible for a division which remained significant throughout the three millennia of Egyptian history. The king of Upper Egypt wore a white crown to which was affixed the head of its totem animal, the vulture. The crown of Lower Egypt was red and carried the head of the cobra. When finally the two kingdoms were united the crowns were combined, with the vulture and cobra heads side by side. Down to the final eclipse of Egyptian power, this unification was remembered on the monuments of the kings where the gods of the two kingdoms, Seth and Horus, were shown binding together the lily of Upper Egypt and the papyrus of the Delta in heraldic pose.